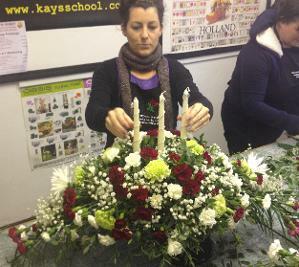 This One Day Workshop is part of our Module 2 Sympathy and Hand tied Certificate Course. A Traditional 13 point flower spray arrangement is not just suitable as a sympathy tribute, but can also be used a a table center piece on a long table, or as an alter arrangement. It is a very versatile arrangement and would be a popular arrangement is any flower shop. This workshop is a hands-on step by step workshop. You will be given step by step notes and diagrams to use later when you practice at home. 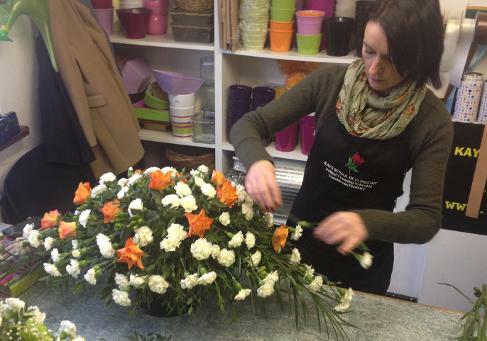 You will green up the arrangement using the 13 point system before adding your flowers using the same 13 point system. Before taking your arrangement home you will have the option to add a candle to it to use it as a table display when you go home. As with all our workshops, everything you make you take home with you. 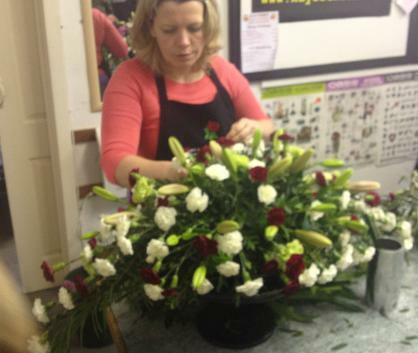 The cost of the workshop includes all your flowers, sundries and tuition. As a student of Kays you will also receive access to our student resource section on our website and full backup support from your tutors at any time. The cost of the workshop is €200 - A booking fee of €50 is required to secure your place on this workshop.